Cross the threshold but maintain your sanity. Receive the message about a strange island appearing in Niben Bay. Enter, sit, and speak with Haskill. Accept Sheogorath's invitation and enter The Fringe. Typically, 24 in-game hours (but ranging from three hours to three days) after the expansion is installed, you will be prompted with a new quest, and a message suggesting that you investigate rumors concerning an island that has suddenly and inexplicably appeared in Niben Bay. Follow the quest marker to a small island east of Bravil. Approaching the landmark, it quickly becomes apparent that this is no ordinary island. With twisted, otherworldly geography overgrown with vegetation found nowhere else in Cyrodiil, the island is an oddity in and of itself - and certainly worth investigating. 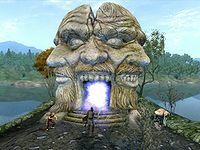 Near the peak of the island stands Gaius Prentus, a Bravil guard, and S'fara, an unhinged female Khajiit, as well as a strange, monolithic statue of three faces joined at their eyes depicting drastically different emotions. What appears to be a rift in the fabric of reality itself emanates from the mouth of the central face, emitting a heavenly blue glow. This is the "Strange Door" mentioned in the rumor mills and your journal, but you are currently unable to enter. Speaking to Gaius, you learn that, unlike you, he is not here to investigate, but to warn. Adventurers like yourself have entered the gate before, but they exited in a state of violent insanity and attacked anything in sight. Gaius has been stationed here to both warn people from entering and, should they ignore his words of caution, "clean up the mess" when they reemerge. Soon, a living example of those who have ventured through the doorway reappears: Belmyne Dreleth. Following a brief bout of nonsensical ranting, Belmyne will attack, just as predicted, and be subsequently cut down by Gaius. "It's lovely in the Isles right now. Perfect time for a visit." Upon entering the door, you find yourself in a small, nondescript room. A door is situated directly opposite from you, but between you and this exit is a large stone table. Seated at the desk, upon which sits an ominously ticking metronome and a copy of The Madness of Pelagius, is a dour looking male Breton. This man, by the name of Haskill, invites you to take the available seat. Once you sit down, he explains that he is Sheogorath's chamberlain, and that his liege is looking for a champion amongst mortals; someone with the strength of mind and body to help Him contend with an upcoming cataclysm, and extends this offer to you. He then gives you moment to think things through, and points out that the door back to Cyrodiil is still open. Should you accept Haskill's offer, he instructs you to see Sheogorath in his palace in New Sheoth for further instructions - assuming you survive the journey there, of course. He stands and exits through the door just before the entire room vanishes, light streaming in through holes growing ever larger, as it becomes apparent that the room was not a room at all but a shelter made of hundreds, if not thousands, of fluorescent butterflies. The swarm travels off into the bizarre, alien horizon, leaving you free to explore the realm of the Madgod. However, you are not actually inside the Isles yet. Rather, you are inside the Fringe, an enclosed area designed to test those who wish to enter. If you want to pass through, you must overcome the obstacles within. If you have trouble getting the quest, or if you are simply impatient, open the console and type setstage se01door 10 to automatically trigger this quest. Alternatively, you can simply travel to the island, which will also initiate the quest. The island is present regardless of whether you have the quest or not (although if you do not have the quest, it will not be marked on your map). Occasionally, Belmyne Dreleth will be pushed off the island into the water during the initial fight. If this happens and he is unable to get back onto the island properly, kill him yourself and the quest will proceed. An achievement will be unlocked upon accepting Haskill's invitation. It is possible that when you try to sit down during this quest, you will appear to remain standing. This bug is actually a consequence of an animation problem triggered by the end of the quest Umaril the Unfeathered (part of the Knights of the Nine plug-in). However, the bug is purely a visual problem. 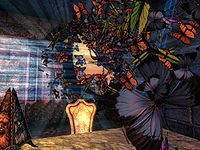 Even though you appear to still be standing, the quest will proceed: all of the butterflies will disappear, after which nothing may seem to happen for 10-30 seconds, but eventually the game will resume. After you decide to enter the Isles, and Haskill stands up and walks towards the door, he may stop in front of it rather than going through, preventing further progress in the game. ? Reload a previous save and try redoing the sequence. I have heard a rumor that a strange doorway has appeared on a small island in the Niben Bay. I should investigate. 20 A guard, Gaius Prentus, has approached me. He tells me that the people here have all returned from inside this strange gate, and all are now mad. 30 I have entered the gate and been greeted by a man named Haskill. He tells me that he is the Chamberlain of Sheogorath. 40 Haskill has told me that his Lord Sheogorath is searching for a mortal to become his champion. I should speak again with Haskill when I have made my decision. 50 I have decided to attempt to become Sheogorath's champion. In order to meet Sheogorath, I must first pass through the Gates of Madness, guarded by the Gatekeeper. 200 I have decided to attempt to become Sheogorath's champion. In order to meet Sheogorath, I must first pass through the Gates of Madness, guarded by the Gatekeeper. It is possible to use the console to advance through the quest by entering setstage SE01Door stage, where stage is the number of the stage you wish to complete. It is not possible to un-complete (i.e. go back) quest stages. See SetStage for more information. Esta página foi modificada pela última vez à(s) 01h27min de 5 de agosto de 2013.